The ACTUAL cost of meetings - it might surprise you! Six Solutions to make all of your meetings, training sessions and conference calls better. 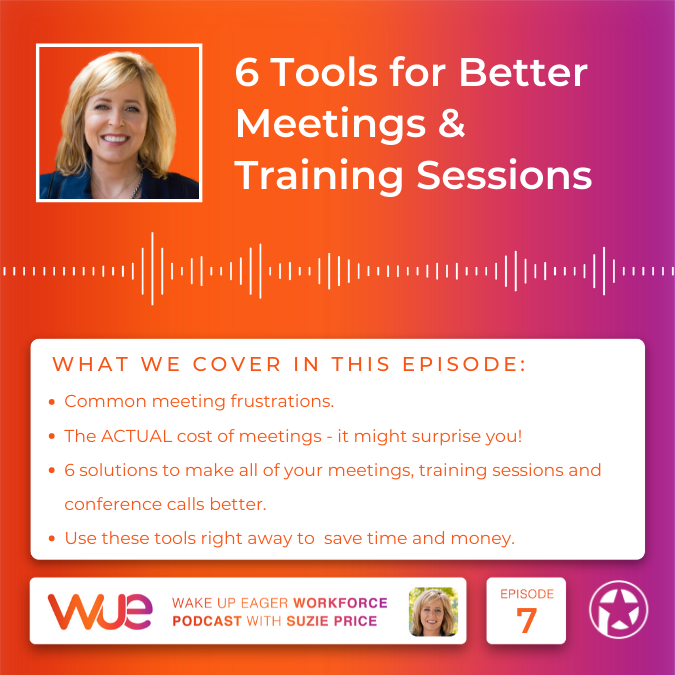 Use these tools right away and you'll save time and money, eliminate frustration and turn those pesky meeting pet peeves and problems into well-run effective meetings and training sessions! Most common frustrations from the feedback I received around bad meetings: leader does not keep control; people dominate, complain or get off track; side bar conversations; attitude; meetings not needed; nothing accomplished; looking at their phones. VIDEO: Bad Conference Call Meetings - A Conference Call in Real Life on YouTube - Very funny, and oh so true! Meeting Cost Calculator - For Example: Average annual Salary -$50,000; Two, two-hour meetings per week, five people in each. TOTAL COST: $556 per week; $28,889 per year, NOT including the cost of benefits. Try it here. It will clarify your thinking and help you keep everyone on track. Put the purpose of the meeting at the top of the Agenda. Apply time frames and intended outcomes next to every agenda item. Send the agenda out in advance to all attendees. Use a timer to guide discussions and to keep the meeting on track. Tool #2 - How to Open a Meeting - Use: I.E.E.I. (Inform, Excite, Empower and Involve) From: Michael Wilkinson, CMF CEO & Managing Director, Leadership Strategies, Inc.
1) Why am I here? 2) Why should I care? DON:T START WITH - the agenda, your bio, where the bathrooms are, etc. Can be as quick as 2-5 minutes. Involve -Get them involved immediately through an engagement question that furthers the meeting purpose. Ask a question related to the meeting focus. Could be: icebreaker, list outcomes they want or a quick check-in. So when I start a meeting or training session, the process that I use that works (as recommended by Michael Wilkinson of Leadership Strategies) is: IEEI, Agenda, Guidelines/Ground Rules, Parking Lot and Introductions – if needed. POST THEM and REVIEW THEM at the start of every meeting. - Energizer – They Pick - Must Be Short, Involve Standing Up and Using Your Voice (examples: YMCA, Chicken dance, Badgers fight song, hokey-pokey.) Anyone can call and time. A piece of blank flip chart paper, with the headline "Parking Lot." It is posted in the room to capture topics that are brought up that are not directly relevant to the agenda. Use it to capture action items for follow up. Use the Parking Lot to “park” information for later in the meeting or after the meeting. This helps keep the group focused on the Agenda and ensures that you don't "lose" important follow up ideas and issues. Have large post it notes and markers around the room or on the table - ask person to place a 'headline' (summary) of the topic on the Parking Lot. At the end of the meeting, review what's in the Parking Lot and determine how and when the item will be handled. Make this "Stop the Bleeding" Meeting Ticker visible in every meeting. Find it Here. Get: Tips for running meetings, listing and breakout exercises for getting information, best ways to close, handling dysfunctional behaviors and disagreement and more!